Liverpool manager Jurgen Klopp said he did not see any of the penalty shootout against Stoke City that took his side to Wembley for the Capital One Cup final - but has set his sights on lifting his first trophy since arriving at Anfield. The Reds triumphed 6-5 on penalties after Stoke won 1-0 over 120 minutes - courtesy of Marko Arnautovic's goal from an apparently offside position just before half-time - to claw back a semi-final first-leg deficit. However, Reds goalkeeper Simon Mignolet made decisive saves from Peter Crouch and Marc Muniesa in the spot-kicks. Klopp said: "I didn't see one shot. I was behind the wall of my players so I had to watch it from there. I will watch it on television at home but it was good watching the crowd instead." 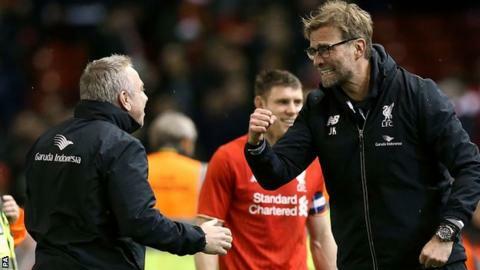 Liverpool will face Manchester City or Merseyside neighbours Everton in the final on 28 February, and Klopp said: "It is very important. I saw that in the faces of my players. "Being in the final is good but the important thing is to win. Their goal was double offside but we got some luck in the penalties. "Now we will watch the game between Everton and Manchester City. It will be a north of England final. Wembley is a cool place to play football but we go there to win - it's not much fun to lose." Everton hold a 2-1 advantage over Manchester City before Wednesday's second leg at the Etihad and Klopp would relish an all-Merseyside final. "It is great to be here in Liverpool. It is a great place to be. It is great the Blues and Reds are together in normal life but want to beat each other in sport, which is normal," added the 48-year-old German. The Liverpool boss singled out 23-year-old defender Jon Flanagan for praise after the right-back was outstanding in his first start since the final day of the 2013-14 season. Klopp said: "He was my man of the match. He has been out since May 2014 and played 105 minutes, and even when we took him out he told us he could go on." Belgian goalkeeper Mignolet has been consistently backed by Klopp despite criticism and repaid him with the crucial penalty saves. "Mignolet did well. It was really difficult," said Klopp. "There were 500 long balls into the box and we are all sitting in our warm chairs saying 'come and do something'. Peter Crouch was only on the pitch to disturb and as a team our reaction was really good." Read more on Manchester City v Everton: Who will reach League Cup final?